Can alcohol abuse cause depression? 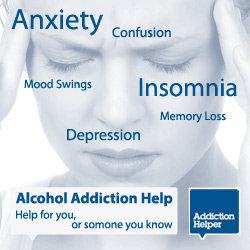 Many individuals who end up with an alcohol addiction can also suffer severely from depression. They may advise, when asked, that they drink to help with the depression. The reality is that drinking large amounts of alcohol will only ever increase feelings of anxiety and depression. Temporary relief may come in the form of numbness of emotions and feelings, but these soon return and feel heighten when the alcohol starts to wear off. Whilst an individual may feel better initially after drinking alcohol, this feeling is short lived. People who are depressed, anxious or have mental health issues, are more predisposed to drinking more and becoming bodily dependent than others. A vicious cycle can develop whereby the individual drinks to relieve depression and anxiety but in doing so their condition becomes worse and withdrawals become harder to handle, leading to more drinking and a down ward spiral.